So, with my few weeks of having the R-S202 in the equipment rack, I was able to relive a bit of my youth and enjoy the sounds of plain old vanilla stereo again. I had almost forgotten what a simple pleasure it was to setup two speakers and just listen to music. Very happy! I have my 4 back yard speakers hooked up to this and am able to stream bluetooth from almost anywhere in my yard with this unit in my garage. Great bang for the buck! I continue to use conventional stereo equipment, and needed to replace my old receiver. 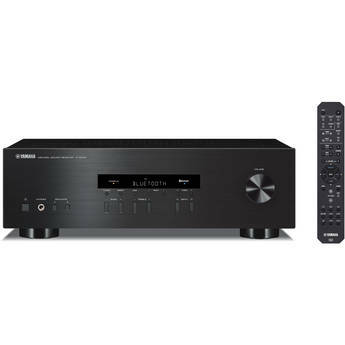 But because I use Bose 901 speakers requiring insertion of an active equalizer between the pre- and power- amplifiers, there are few receivers now available which provide that capability. Receiver works fine. I was surprised at the level I needed to turn the volume dial though. Building a vintage stereo system. What a deal, powerful enough to drive three sets of quality speakers with clean power. CD s, records and in a jam...Bluetooth!. Best of all the price is right! I bought this to power a set of DIY speakers I built with my son for his room. During the time we were building the speakers the amp on my main system died on me and I decided to hook this up while waiting for a replacement. Great price for such a featured packed receiver. Bluetooth is a nice feature to have. Price is great and so is the sound quality. For the money it offers a lot of good sound... I got this unit to replace my Yamaha receiver from 1981 - while perhaps not as 'warm' sounding it does deliver a great value! Wanted a Bluetooth receiver to set up for my patio. This receiver works great. I liked it so much I ordered a second one for my place at the lake. Very easy set up and the sound quality is superb. For the price it cannot be beat. This thing is a great value. The bluetooth works very well. Plenty of power. Simple design. Remote extremely responsive and user friendly.